Bonnie Koenn--The sunny days ahead will provide a good time to grill some fresh cut meat. Long sunny days, pleasant weather and friends. These are the ingredients necessary for people to come together and enjoy a barbecue. California Baptist University students are preparing for their summer break and many of them will no doubt be attendees of at least one barbecue. Great meat is the start to any barbecue. It is always a wise decision to make quality a priority whenever possible. – Start off by finding the most reasonable price for the freshest possible meat. If a local butcher can cut the meat right at the time of purchase, great! That ensures the freshest cut. – If fresh cut meat is not available, local grocers have a meat section with meat that is packaged and priced according to weight. Check the firmness of the meat. Fresh meat should be firm and not mushy. Also, check to see if blood has collected at the bottom of the meat. If there is blood, that means the cell walls of the meat have started to break down and it is not fresh. – Look for fat. Fat is the white layer attached to the meat. Remember that fat adds flavor but some people care more about their figure and less about flavor, so cater to the guests as much as possible. Seasoning is varies depending on the chef. However, try to use seasoning as a compliment to the dish so that it will not overpower other flavors. – Salt is used to draw out flavors. The right amount of salt is key to getting that perfect taste to any meal but use it sparingly. – There are different ways to season meat. Different styles of seasoning require different amounts of time to be ready, so plan ahead to guarantee that the seasoning has the right amount of time to work its magic. Different barbecue grills can affect the taste of the meat. Charcoal grills have that unique smoky flavor, especially when used in conjunction with a smoker. 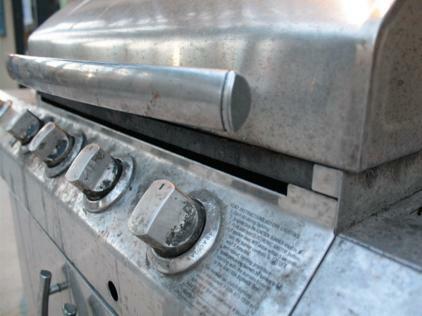 Gas grills provide a constant and steady temperature. Electric grills, like the George Foreman Grill, provide grilling opportunity even in a small space. – Keep the surface clean. Not only does this prevent bacteria from growing on the surface but a clean surface provides an even cooking surface for the meat to cook but barbecued meat looks professionally done when it has the grill lines cleanly burned on the surface. – Good tools to use when grilling should include a sharp knife, a spatula/turner, tongs, a meat fork and a meat thermometer. Make sure the meat is cooked properly. Different types of meat have different cooking times and it is important to know these times so that meat is not undercooked and the risk of bacterial presence in the food is eliminated. Try to visit www.usda.org to learn more about health standards for cooking. Use the meat thermometer to check the internal temperature of the meat before serving. – Steaks, roasts, and fish need to be cooked to 145 degrees Fahrenheit. – Pork and ground beef should be cooked to 160 degrees Fahrenheit. – Poultry should be cooked to 165 degrees Fahrenheit. These are the basics to having a great and safe barbecue. Try different recipes with friends and family and show off these new barbecue skills.